How do I configure ‘Set up connections…’? Start InfoFlo by double clicking on the InfoFlo icon on your desktop . Here you can configure the necessary details used to connect to your InfoFlo Server. 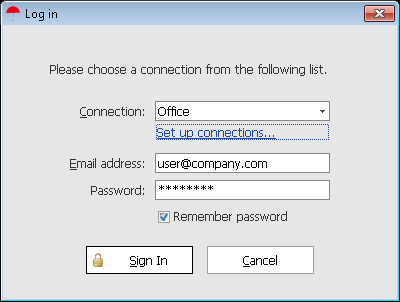 Most of these can be left as default but the most important details are Username (email), Password and Server IP. Label: Name of your connection. Username: Email address of the InfoFlo user. Server IP: IP or Hostname of InfoFlo server (ie. 192.168.1.100, InfoFlo-PC). If you are accessing InfoFlo from the server computer, you can put 127.0.0.1 which will point to localhost. You need to ensure that the IP of the server is static, which means it will not change the next time you wish to connect. Your technical staff will be able to help you set that up. If accessing from a remote location, the server IP will have to be static or a dynamic dns hostname can be created and inputted in this text box. TCP port: 8082 is the default TCP port for InfoFlo. This port must be opened in the computer’s firewall it order for InfoFlo Server to be accessed. In order for InfoFlo Server to be accessed from outside the network (from a remote location) port 8082 will also have to be opened in the router firewall and directed to the server (or other pieces of networking equipment that may be blocking this connection). HTTP port: 8443 is the default HTTP port for InfoFlo. Check if use proxy server (not necessary to configure in most situations) – This is checked if you need to connect to InfoFlo Server via a proxy server. Proxy server IP: IP for proxy server. 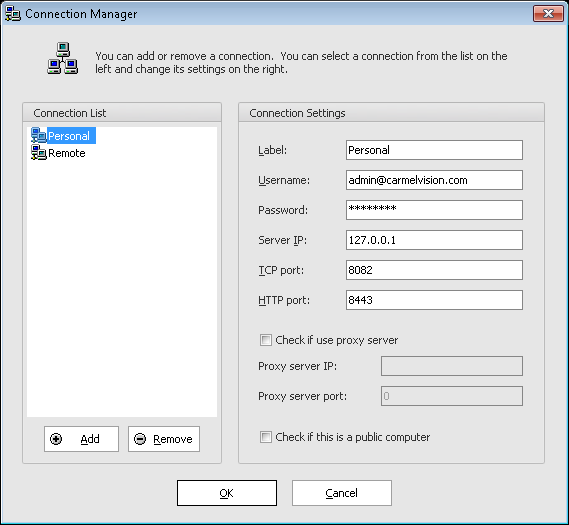 Proxy server port: Port for proxy server. Check if this is a public computer – This is checked when InfoFlo is accessed on a public computer. InfoFlo’s cache will be deleted on exit. Please leave this box unchecked on a trusted computer. Click 'OK' to save your changes and close the 'Set up connections...' window.